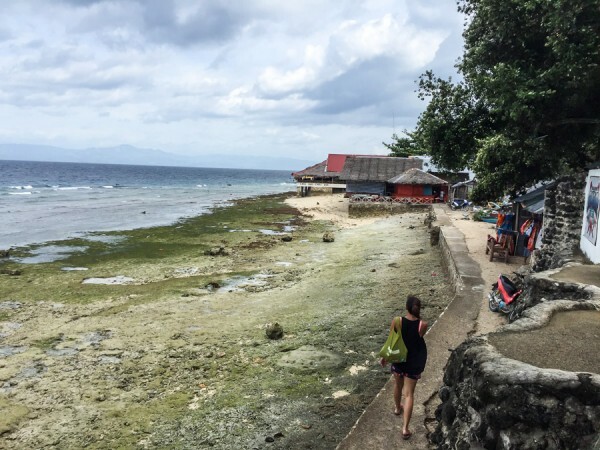 Getting to Moalboal was by far, our longest transit day in the Philippines. We were arriving from El Nido, Palawan which meant, a 5am wakeup call to catch a 5-hour shared shuttle van ride to Puerto Princesa. There, we waited another 2-hours to catch an hour long flight to Cebu City. From there, we our private car picked us up and we headed straight for Moalboal but what was meant to be an easy 2.5-hr ride ended up taking us 4.5 hours in heavy Cebu traffic. 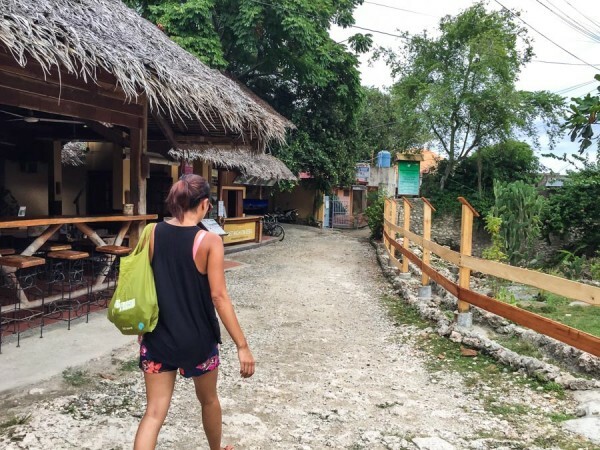 We arrived at Marcosas Cottages Resort at night only to find the receptionist just left. Took a couple of knocks and calls but we managed to get checked in, settled down before heading out for dinner. 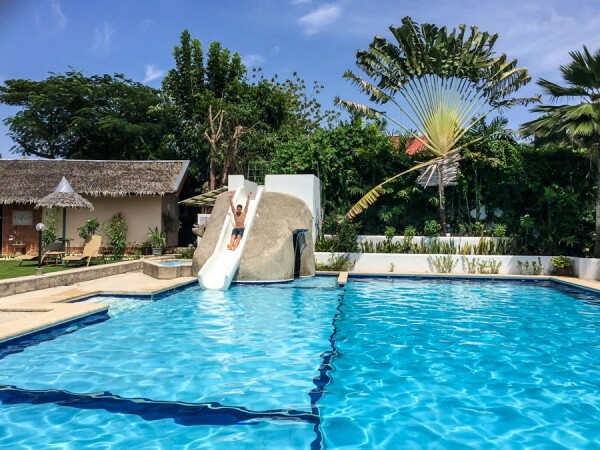 The rooms are individual cottages, spacious and private, equipped with aircon, fresh towels, television, fridge and hot showers. The “resort” comes with a swimming pool complete with water slide and grotto. There is a spa, though it’s nothing like the ones from home. I would not recommend booking a massage, not unless you want to be simply rubbed up and down and up and down for an hour. It was hardly relaxing. I would not come with high expectations. Most days, our meals were mediocre at best. That said, there are plenty of restaurants along the main strip of Panagsama to chose from, all dishing out one and the same basic menu. Lantaw is probably the best on the strip with an extensive menu from traditional Filipino dishes to Thai and Indian. The sinigang was too sour for my taste but the sizzling chicken was good as was the spicy Thai green curry. LOVE the staff here, they are extra friendly. 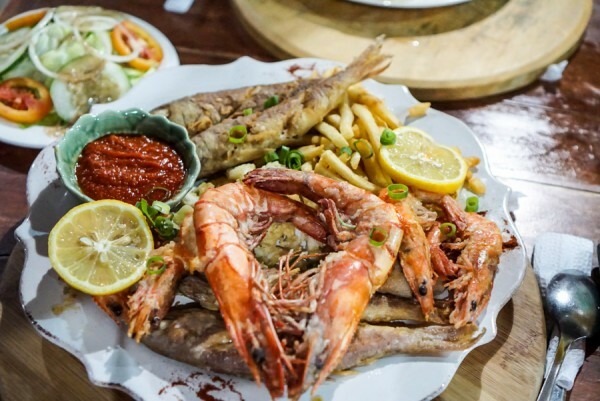 The Pleasure Principle Resto-Bar has a ginormous seafood platter complete with fried fish, shrimp and fries. It’s a lot of food for two. Make sure you ask and check the seafood for freshness otherwise you will get day old shrimp or squid. Silver Ray offers Italian but we did not have any. We prefer their calamari rings, sautéed beef and veggie and the prawns in garlic butter sauce is finger-licking good! Last Filling Station is another one we frequented for lunch. We highly recommend the pork sisig and pretty much anything cooked on a sizzling platter is safe and delicious. Chili Bar is a where tourists, expats and pretty local young ladies come to hang out, drink and shoot some pool. 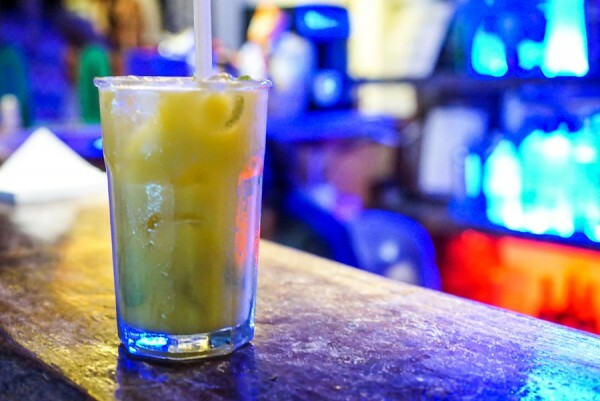 We waited forever to order their signature mango mojito. If you’re feeling adventurous, Moalboal is an action filled, adrenaline junky’s dream destination: from mountain biking to jungle trekking, horse back riding and water sports. We did not do any of the land activities. 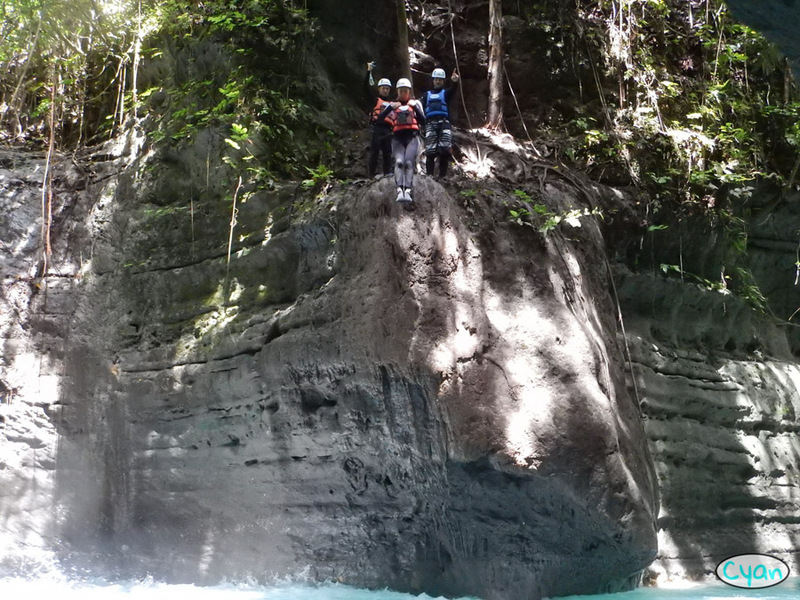 We opted to go canyoning with Cyan Adventures instead. Another water activity we desperately wanted to do was to go diving and see the Sardine run but unfortunately for us, hurricane weather made water conditions extra choppy and unsafe especially for a couple of newbie discovery divers like us. We were extremely bummed. Google the pictures and you will understand. Oh well, I guess we have to come back for it next time. We have to preface that there is some controversy surrounding the whale sharks in Oslob (just google it). 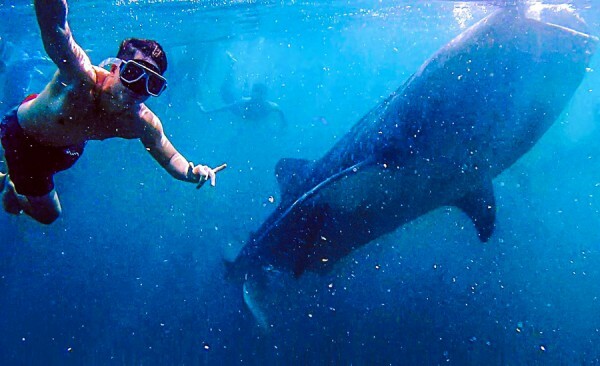 If you do decide to go interact with these amazing mammals, you won’t need more than half a day for a short stint to Oslob from Moalboal to go swim with the whale sharks. In fact, we left at 6am, arrived around 8am, got briefed and rinsed off — no sunblock while swimming with the whales — and was in the water by 8:30am. We were only allowed 20-minutes max and those minutes just flew by. We opted to skip the nearby Tumalog Falls since we just saw Kawasan Falls the day prior. Before we knew it, we were making our way back and still made it in time for our complimentary breakfasts with half a day to spare for pure relaxation by the pool. Important tip: wear a swim-shirt or suit — there are jellyfish in the water! And, they sting. It’s not as bad as it sounds, they’re not poisonous and it felt more like small static shocks than anything. You will itch for a bit afterwards, but then it goes away. What’s your favorite thing to do while in Moalboal, Cebu?